When making the cruiser rack, consideration was made to holding down the load. And what if the load varied. Decided on eye bolts drilled through the cedar base where there are approximately 10 in varying positions. I ended up using 5 buckle tie downs. Two are permanently on the rack and 3 are threaded through the eye bolts. Another consideration was visibility on the road. My observation while in a car, was that single riders, wearing black, were hard to see. Decided on having hi-visability material sewn up to put some of the gear in, so my rear gear was highly visable when cars approached from the rear. With my wet weather hi-vis jacket strapped on the top this also provides side visability. The following pics shows my procedure in loading the gear. Left hand pic: I place a piece of 50mm treated timber (and carry it with me) under the stand to avoid a 'tip-over'. The weight on the cruiser rack tips over my bike in a standing position if I do not use this. Right hand pic: Five tie down straps are used to tie the gear in place. 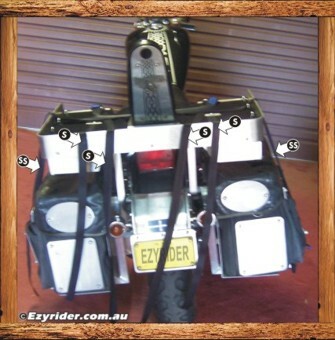 Two are attached to the cruiser rack (see cruiser rack build), two are threaded through the 'eye-bolts' on the cruiser rack, and one is a side strap, threaded also through 'eye-bolts' attached to the cruiser rack. Left pic: First items are the folding chairs (A). On top goes the shade tent at (C) and on top of that goes the bed at (B). These are all tied down with the buckle straps attached to the cruiser rack. Right pic: Next goes the two burner cooker at the front of the sissy bar at (C) then the tent in front of this at (T). The sleeping bag at (SB) is placed on top of the bedding where the remaining two buckle straps are connected to hold down all the load. 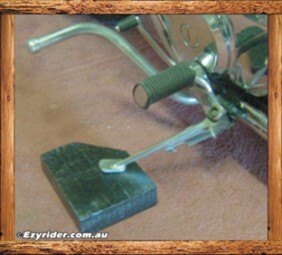 A short support strap (SuS) holds the main buckle straps together. A side view of the load shows how the support strap at (SuS) keeps the main strap together (S) to also keep the cooker (wrapped in a water proof sheet) in place (C). 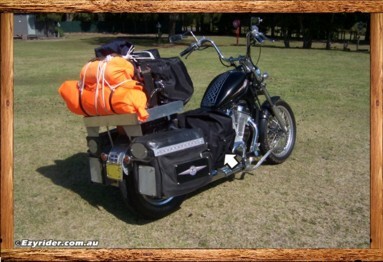 There is more room for packing (P) some other lighter gear, where the side strap (SS) is used to tie down this gear. The tent is a good back rest (BR) for traveling as it sits to the front of the rear passenger seat (RS). I've found this is as high as the gear needs to go to maintain bike stability. Any higher there is a dangerous 'top-heavy' stability movement while traveling. 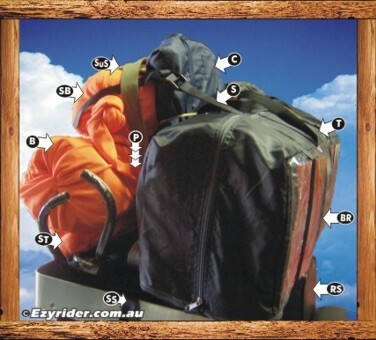 All other gear is placed in the saddle bags, on top of the saddle bags, and two extra back packs to the front of the saddle bags. Keeping this gear close to ground level, providing low to gravity stability. Loaded and arrived at camping site on a recent trip. I used white ropes this time but still provided the same result. 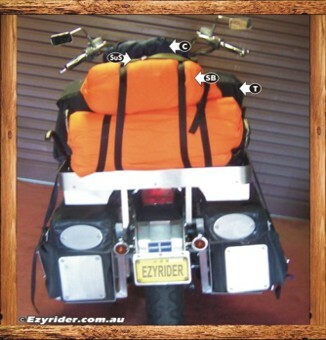 The arrow shows one side of a twin back pack storage system. They were knitted together with opposite back straps and thrown over the seat. 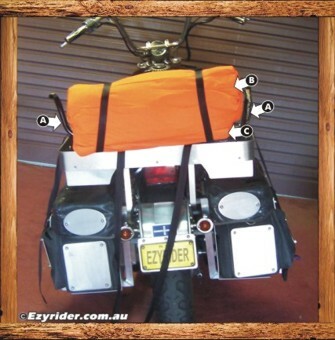 This provided a major accessory addition for more gear and equipment and kept the load/weight ratio close to ground level.